In spite of being a lifetime nomad, I have roots from the deep south, so, I am a total sucker for grits served up any way. (Except the soupy, runny Army kind.) One of my absolute favorite meals to get when I am home is the “delicacy” of low-country shrimp and grits. Unfortunately, grits are a corn product, and therefore not truly paleo or primal. Until recently I haven’t even considered them. But, just the other day it dawned on me that I could try to make “grits” from cauliflower. I was SO excited, because on the spot, my recipe and side dish options just opened wide up. You can do a lot of things with a little grit. Cut the head of cauliflower into quarters, remove the core. Place it in a food processor and pulse until it looks like grits. I had to do this in 2 batches. Place the cauliflower grits in a pot. Add chicken broth, put lid on pot, and simmer until soft, about 20 minutes. Drain off excess liquid, toss with parmesan, salt and pepper. While the cauliflower-grits are cooking, cook the bacon until crispy. I baked mine at 400 degrees. (Thanks for the tip, Kristen!) Reserve 4 tsp of the bacon drippings. Crumble the bacon. Toss the raw shrimp in the arrowroot powder, salt and pepper and set aside. Saute the mushrooms or peppers in the hot drippings until tender. Add the onion, saute 2 minutes. Add shrimp and garlic, saute 2 minutes. Stir in chicken broth, lemon juice, and hot sauce. Cook 2 more minutes, stirring often to loosen particles from the bottom of the pan and help the mixture to thicken. Spoon the shrimp mixture over the “grits” and top with crumbled bacon. ← Getting started and what’s for dinner tonight? explain arrowroot…what kind of ingredient is it? what does it do? what is it for? Arrowroot flour is a powder made from the “dried root of a tropical plant” and it can be used as a thickening agent in sauces and soups. It can also be used for breading. Yum! Thanks for posting! I love the idea of cauliflower for grits! Disclaimer: I understand that as Leigh’s husband, I am paid to tell her that all her food tastes good. However, I can sincerely say that it doesn’t matter with these paleo recipes. I can’t believe she is able to make these meals taste so good using only paleo ingredients. 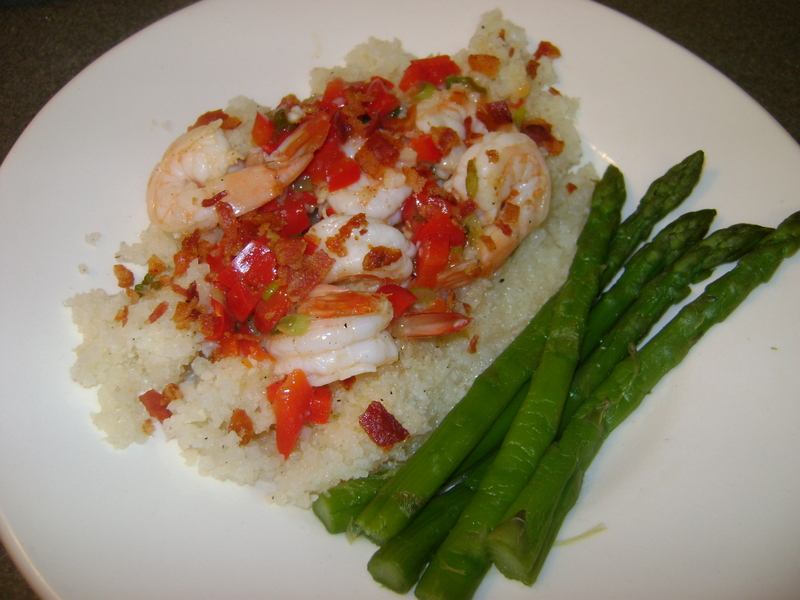 Official Comment: This shrimp and grits recipe is one of my favorites! I’m still waiting for paleo loaves of bread so I can eat sandwiches again!!! e. i love you. thanks for the kind words. also, sandwiches are so out. that single invention alone may have wrecked the american diet. so… Stan would like to try this!! 🙂 SO… next time you make it… can you bring some over!!! I’m lazy!!! 🙂 but, maybe I’ll make it next week 🙂 🙂 looks yummy!!! we need to just have yall over and i will make this. we will convert our men one dinner at a time. Made this last night, delish! MLK gave it a ten out of ten. making this tonight. YOU ARE AWESOME. thanks for the feed back!! great to hear that other people enjoyed it! did you do mushrooms or peppers? I usually double this recipe, well, MOST recipes, so we have lunches for the next day. Glad to hear he enjoyed it!